Mail merge was a word-processing feature originally popularized by software such as WordStar and WordPerfect. In very simple terms, it is the ability to create multiple copies of the same document where certain pre-defined placeholders are replaced in each copy with a set of values picked up from another document or data source. A typical mail-merge scenario would be for a company to send a common letter to all its customers. For this, a template document is prepared. It would contain the contents of the letter that is same for all recipients. The places where the names or addresses need to appear would be left empty but marked with certain placeholders. When the mail-merge operation is performed, the placeholders would be replaced with individual customer details kept in another document as rows of delimited data. In Microsoft Word, the placeholders are called merge-fields and the merge-field data can be picked up from a variety of sources such as spreadsheets or databases. When mail merge is performed by code, many more data sources can be used. In November last year, we previewed the mail merge functionality in Document Studio. It it is now available as a full-fledged feature. Rather than tacking the mail-merge functionality on the IDocument interface, we came up with a MailMerge utility class with a very simple API. With a new MailMerge instance, the developer would only need to specify the input template and connect it to a data source to get the mail merge function ready to roll. For those, who need more than the default functionality, several optional features and event hooks are also provided. We also introduced a IMailMergeSource interface that developers could implement to integrate custom and non-standard data sources. To see how this mail-merge function works, here is an example. 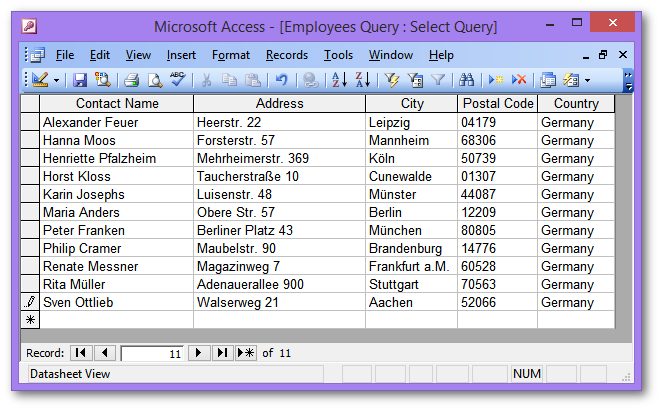 For the sake of simplicity, the NorthWind database that is shipped with MS Access has been used in this example. (NorthWind database is also shipped with SQL Server and you could use that too.) The Customers table in the database will be used in conjunction with a DOCX template document. To keep the list short, the table had been filtered to customers from Germany, a total of 11 records. The data source for the merge operation is a DataTable created from an Access database. 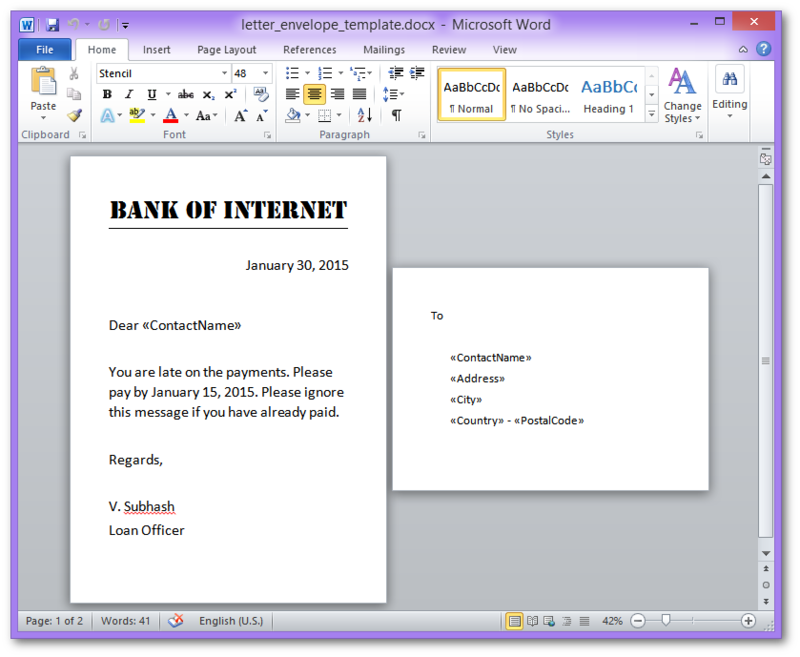 Then, a DOCX template document was created in MS Word. Some merge-fields with the same name as the column names from the Customers table were also inserted in appropriate places. Then, in Visual Studio, a Windows Forms project was created. The MDB database file and the template document were then copied to the Debug/Release folder to eliminate the need to specify absolute pathnames. A button-click handler did the mail merge. When the button is clicked, the application created 11 output documents. 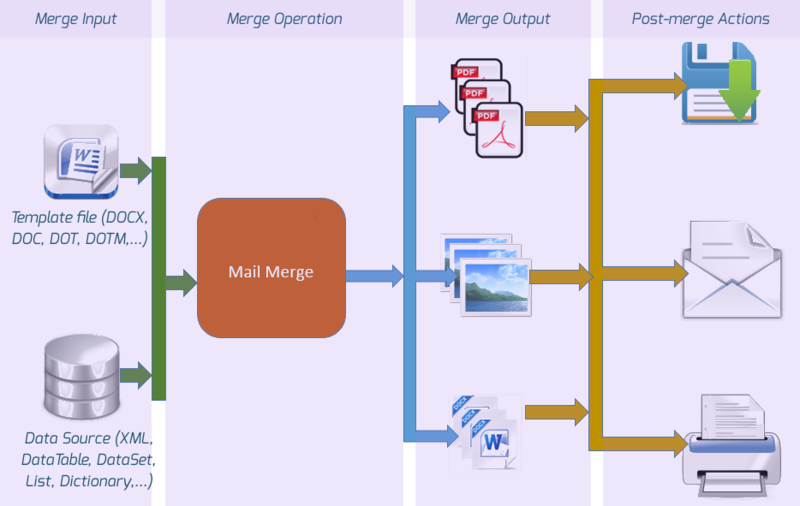 This animation shows the documents that were created as the output of the merge operation. This animation shows the output folder. The Merge() command requires a post-merge action. Here you can specify if the output document needs to be saved to a file or a stream or just sent as an e-mail attachment. It could also be saved to a custom document format that you have derived from IDocument. Another novel feature in the Merge() command is the ability to specify merge-fields in the output file names too in the same way that you specify them in the template document. The MailMerge class provides several events that provide you more control over the entire mail-merge operation. The EndJob event has been used in the code example given above. To provide a non-disruptive performance, the Merge() method returns without issue. Errors encountered by it are available only if you handle the Error event. 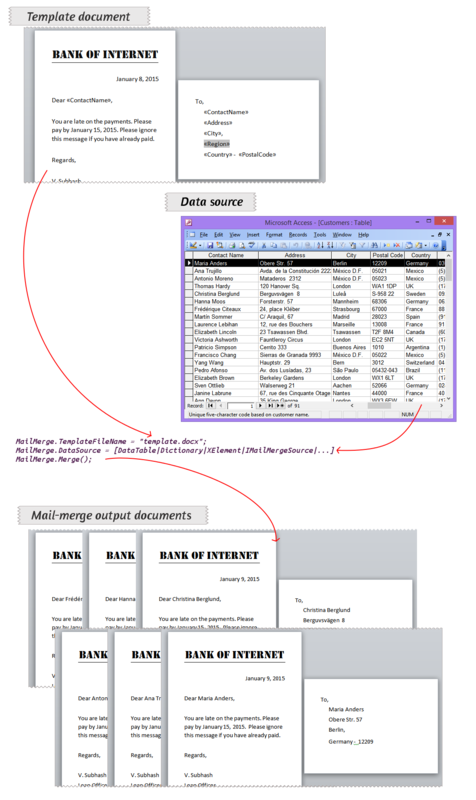 Currently, MailMerge can generate documents in the following formats. In future, more formats will be supported.